When it rains in Beirut, it pours. Water smashing against windows, deafening thunderclaps, roaring tin-roof-cacophony…real act-of-God stuff. It’s been storming sporadically all week; each time it does I feel indescribably small, and for some reason this is thrilling. My limbs go soft and I pad around the house aimlessly, grinning like a toddler. I’ve been hanging out with photographers, and I think it’s affected the way I communicate. Overwhelmed by the impossibility of relaying what I’m living here, I anchor myself in snapshots—carefully cropped moments—hoping that in these still frames, some movement will come through. I’ve earmarked so many of these moments to come back to, once I’ve collected enough pieces to map a coherent narrative. But it’s not happening, because my days—like this place—are contradictory and fractured; and as I wait for it all to tie together I can feel that my meticulously stored images are slipping away, fading. 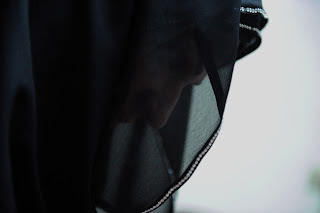 Bilal is crouched down snapping pictures of Nour’s face through her veil. He shifts and dodges like a boxer, while commanding her to lift and lower and turn and what-have-you. Nour giggles and follows his instructions while nonchalantly reading my future in my coffee grounds. She is the picture of a modern woman being pictured as a traditional woman. I am confused by everything, even my own attempt to describe this moment. 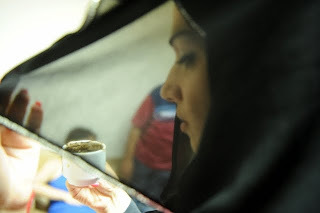 I find myself wishing I had brought my camera to take this picture of Bilal taking this picture of Nour. Assaad Chaftari meets me on the bottom floor of the Haptuur Mall. He is softspoken and handles everything he touches—his spoon, his coffee cup, the bite-size cupcakes that he pushes towards me—with shaky tenderness. If you google him you’ll learn that he is a past LF intelligence officer and current peace activist. If you sit with him for three hours, you’ll learn that he can’t eat sugar, he has a grown son, and he advocates spending half and hour at the start of each day in quiet reflection—“And if you’re very busy and stressed, a full hour. This time is your compass.” Assad wants to gather a small and balanced team of ex-fighters together to make a play that can tour to schools. Thrilled, I e-mail him a proposal the next day, and he thanks me and asks for some time to digest. I’ve already incorporated his half hour of quiet into my daily routine, so the waiting just feels like the next logical lesson. I soften around the edges as the I settle into my third week in Lebanon; pushing less, and listening perhaps a bit more. Fateh Azzam greets me with a warmth that manages to fill out his massive air-conditioned office at the UNHCR. He smirks a bit at the mention of a “well-balanced team of creators.” “Growing up in the Palestinian camps, I was subjected to a lot of these cross-border initiatives where we all create together and we all learn that we’re the same. These programs don’t work. We know we’re the same, we know we want the same things. So your play can’t end with that, like it’s a new discovery. You have to start there. Start with: we know we all are the same, and we all want peace, so why can’t we get it?” He talks about the corruption within the parties; the mafia-family structure of the confessional system; the impossibility of social advancement without self-identifying along political-religious lines; and the ease with which leaders can break up unified social movements by prodding old wounds and stirring up heat between different religious groups. Yesterday’s meeting stoked my idealism; today’s reminds me to stay savvy. Hearts and minds. Beirut is small; you run into your friend, he buys you a coffee, then leaves you with his friend, who takes you to the next place. This is how I end up in the office of Reuters International, deep in conversation with chief photographer Jamal. He shows me his pictures of the border with Israel. 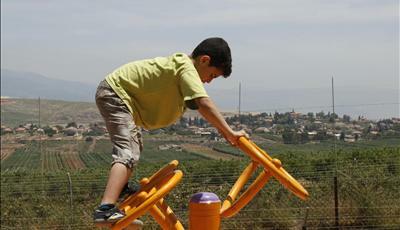 There are tanks on the Israeli side of the fence, and a children’s playground on the Lebanese side. A boy plays intently on an orange structure, apparently unaware of his own symbolic significance. The message is powerful, a kind of defiant pacifism. I learn that there is no nationally-recognized history curriculum, and that each community either teaches their own version of events post-1946, or doesn’t teach them at all. This strikes me as an incredible theme for a high school touring piece. I drop a quick note to Assaad, and then sink back into waiting. Religions begin to expand their definitions to include languages, mannerisms, city blocks, surnames. I feel like a child being taught gender. Things that are obvious to everyone else are just starting to creep into my understanding. Blue is for boys. French is for Christians. Girls play with dolls. Muslims drink jallab. These are things too obvious for anyone to bother saying out loud. A new friend expresses distrust of an old one, which throws me. On the surface his reasons seem personal. I pry, gently. Hezbollah and Hariri are mentioned, and the distrust starts to look more and more political at its core. For some reason this comforts me enormously. 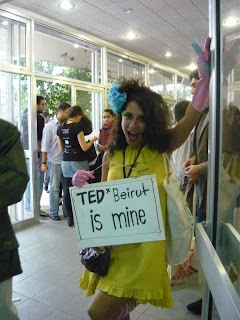 I am at TEDx Beirut. While Sabine is clowning around (literally—she’s a “theatrical volunteer”), I’m making small talk with a girl from Mad Skillz, a social media advocacy group. 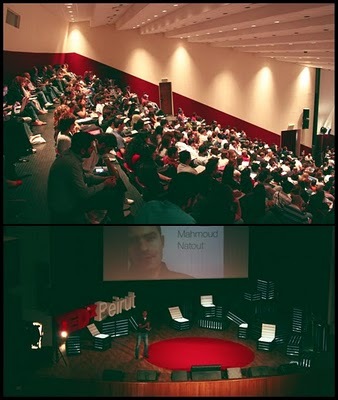 Our conversation works its way to South Lebanon. She mentions the playground at the border. “It’s a gym,” she says, “for training children.” The message is powerful, a kind of defiant future threat. I read Sabine that last paragraph, and she makes a face like she’s eaten a lemon. “Where is this park?” she demands. I nod agreement to her implicit protest and go back to my computer. Google yields nothing about a “gym for training children.” I do find quite a lot about a public picnic area built in Maroun ar-Ras, which was an area of massive devastation in the wake of 2006. Atop a hill in this park flies the flag of Iran, the country that bankrolled the project. Is this pure propaganda or a generous gift to local families? Is it peaceful or aggressive? Both. Neither. Every story in Lebanon has at least two sides, and each of those sides has countless versions.